Mahei is an Argonian scout living in Leyawiin. He is a basic trainer in Athletics, a skill he no doubt picked up while running and hiding from his nagging wife, Numeen. They can sometimes be seen together, however, as they are both regular guests of the Countess at Castle Leyawiin. Mahei wears a black & burgundy outfit and a pair of blue suede shoes. He carries his key and a large amount of gold. Mahei introduces himself by referring to his difficult relationship with his wife: "I am Mahei... that poor fellow who is chased everywhere by that nagging fishwife, Numeen. Please. Just don't mention me to her, or she will burst into one of her tirades..." and brings it up again when asked about the city, "There are things I like to do. Does this never occur to her? Does she think I live each minute to run her errands for her? She wonders why she cannot find me? Doesn't it occur to her? That I am hiding from her?" Between 10am and 1pm every day there is a 50% chance that the Countess will stop by Mahei's house to see Numeen. If so, Mahei will not provide training during that time period. Mahei and Numeen are also known as the Derics: the key to their house is called the Derics' Key, and there are two rumors that refer to their constant bickering: "Have you heard the Derics arguing?" and "Have you seen the Derics recently? They're always bickering with one another." It is likely that Mahei and Numeen were originally Bretons. 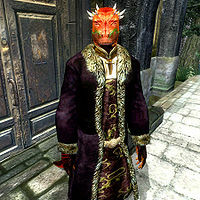 Almost no Argonians have a surname, and "Deric" is similar to other Breton family names ( Liric, Maric, Meric, Aric, Fransoric and Jenseric can be found in Morrowind and Oblivion). This would also explain Countess Alessia Caro's habit of dropping in to see them despite her dislike of beast races. This page was last modified on 25 March 2018, at 03:01.